Cindy Leigh McGinley has been creating, improving upon, and constantly re-inventing herself for many years. She holds degrees in Equine Science, Education, and Mental Health Counseling/Equine-Assisted Mental Health. She was a tutor of Equine Anatomy & Physiology at Morrisville College and was the teaching assistant for the Draft Horse Driving Course. 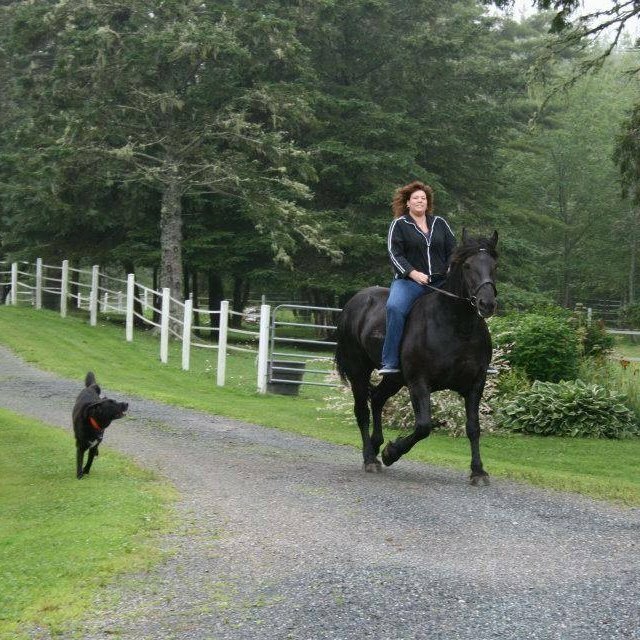 She has experience as an assistant trainer at a Percheron horse farm and worked briefly as a veterinary assistant at a local practice before obtaining her B.S. in Education and her New York State teaching certification. 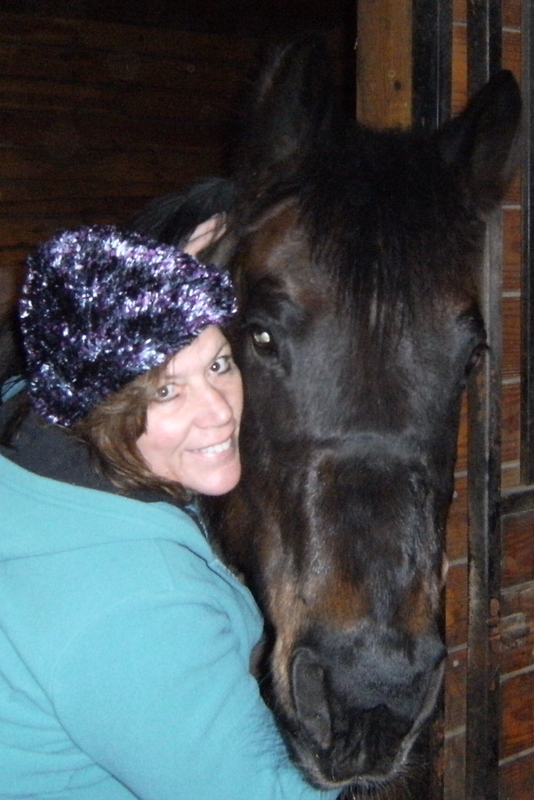 Cindy has been in the horse industry for over 30 years as a professional trainer, riding instructor, and show judge. Cindy has been teaching English and Western riding, driving, and horsemanship to both children and adults for several years on her own horse farm, Rivendell, in Chittenango, NY, which she established in 1985. She has also been quite successful showing her own horses under saddle. She is extremely passionate about including the horse as an ally and partner in her life, and just as passionate about facilitating that transpersonal connection for her clients. As an educator and former classroom teacher, lifelong learning is important to her, and she strives to remain current in her field(s). She has completed several certificate courses taught by Eleanor M. Kellon, VMD, in such subjects as NRC Plus, Equine Cushing’s Disease & Insulin Resistance, Nutrition as Therapy, Arthritis & Other Lamenesses, Comprehesive Care of the Older Horse, and The Basics of Reading Radiographs. Cindy became interested in traditional healing methods for both humans and horses over 20 years ago and keeps her foot in the herbal world, mainly working with natural and herbal treatments for horses. She is an ordained minister, and has spent a lifetime studying the ways of Nature and Spirit, becoming increasingly aware that balance between body, mind, and spirit is essential for achieving complete wellness. She is also trained in the way of the shaman, and continues to develop in shamanic healing and shamanic counseling through workshops and seminars with some of today’s leading shamanic teachers. She completed an apprenticeship with Amazonian-trained shamana Connie Grauds, and has also found a special affinity to ancient Celtic and some Native American medicine way practices – no surprise, as these are her ancestral cultures. She also trained for several years in Aikido, a strictly defensive Japanese martial art, and was greatly influenced by the philosophy of the “Way of Harmony.” She is a graduate of Sandra Ingerman’s 2-Year Shamanic Teacher Training. Cindy is also certified in Screening, Brief Intervention, and Referral to Treatment (SBIRT) and in Mental Health First Aid. Cindy is a consulting hypnotist certified by the National Guild of Hypnotists and specializes in stress management and post-traumatic stress disorder techniques. She also specializes in past life regression and was trained by Virginia Waldron through the International Board for Regression Therapy (IBRT). Cindy is a member in good standing of the American Herbalists Guild, the New York State Farm Bureau, the Society for Shamanic Practitioners, and the National Guild of Hypnotists. She is a member of the American Mental Health Counselors Association (AMHCA), and as a member of the American Counseling Association (ACA), she adheres to its Code of Ethics. She is also a member of the International Coach Federation and the International Association of Trauma Professionals. Cindy is a former wildlife rehabilitator and still advocates for wildlife, as they are increasingly crowded out of their habitats and encroached upon by humans. She maintains a sanctuary where all living creatures are welcome and safe from harassment. Cindy is the author of Purple Roses and Other Poems, a book of original poetry, and was honored when one of her poems, The Sacrifice, was chosen to be published in an anthology. She also edited Alf’s Little Book of Wisdom Sayings, a collection of uplifting and inspiring quotes. (15% of the proceeds from sales of this book go to DSLD research.) In addition, she has written articles (notably, The Sacred Celtic Horse and Druidism: A Glance at the Past Reveals a Vision for the Future) for Celtic-themed publications. She also authored two chapters in The Book of Keltria: Druidism for the 21st Century. Cindy is currently writing and teaching classes in her areas of expertise at Onondaga-Cortland-Madison BOCES adult continuing education in East Syracuse, NY (Henry Campus), and receives clients by appointment at Rivendell Farm in Chittenango, NY.